The MERG CBUS Event Capture tool can simplify configuring JMRI to work well with your CBUS installation. To configure JMRI Sensors, Turnouts and Lights, you need to identify the associated MERG CBUS events. There are several ways to do this. This page uses the capture tool to configure a Sensor as an example, similar methods work for Turnouts and Lights. The upper part of the screen can capture multiple MERG CBUS Events, which you can then use to create Sensors and Turnouts. When a new MERG CBUS message comes it, it will be captured in the highest line that has the "Capture" box checked. The box will then be unchecked so the captured message is not overwritten by later MERG CBUS messages. If you check a series of boxes, you can capture a series of messages. Once you've captured the Event you want, you can copy and paste it into the boxes in the lower part of the window. If your computer allows it, you can also just drag and drop the value into the lower field. You can just type an Event ID in the field next to "Active On", and then press "Create". A Sensor / Turnout / Light will be created that goes Active when the Event is seen, and Inactive when the opposite Event (ON vs OFF) is seen. If you want to associate Active and Inactive with completely separate Events, you can enter the Event IDs in the two fields and click "Create". If you can make the layout emit the desired Event, for example by pressing a fascia switch or throwing a turnout, you can capture that Event and use it. If you press the "Capture Next" button next to one of the Event fields, it will stay down (activated) until the next MERG CBUS Event (CAN frame) is seen by the program. That Event is captured into the neighboring field for later use. 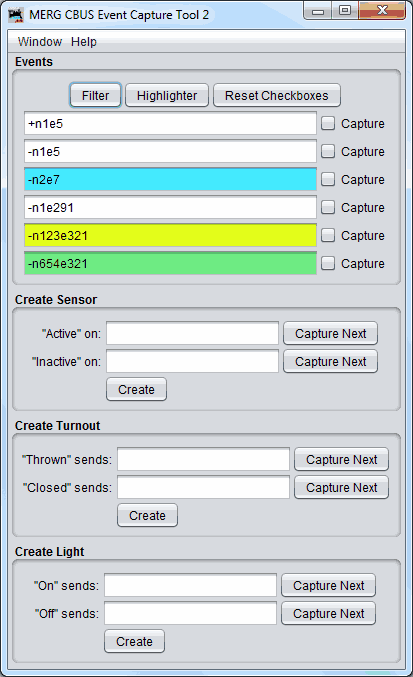 You can separately capture the two Events for a Sensor, Turnout or Light if desired. You can open up a new filter or event highlighter window by clicking on the buttons at top of the screen. You can also open the Capture Tool via the Console Log. In this case, the filter and event highlighter used by the console log will be shared with the capture tool. Any windows opened this way can be identified by the title. Once you've created a MERG CBUS Sensor or Turnout, you can use the Sensor Table, Turnout Table or Light Table to adjust the details. The MERG CBUS Console can help you figure out what events are happening on your layout. You can view this help page within JMRI by selecting Help > Window Help in the top bar of the MERG CBUS Event Capture window. Main JMRI MERG CBUS Support page.